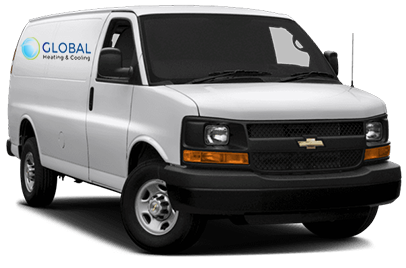 AC Repair * No trip charge for any repair over $150! Call for cooling experts today. Has the weather just reached a point where open windows do not provide enough relief from the climbing heat? The beginning of the summer, when an air conditioner is switched on for the first time in months, is the most common time for it to malfunction. Don't wait until the heat is unbearable, call Global Heating & Cooling today at (773) 801-3734 so that our professionals can get your air conditioning system thriving again! Low levels of refrigerant - If the refrigerant (the chemical responsible for cooling the air) is low your system will not operate correctly. If you find that your refrigerant is low after having the unit charged in the not-to-distant past, this could indicate that there is a leak that needs to be repaired. Fan not working - The fan's job in an air conditioning system is to move the warm air from your home to outside of your home. Fan malfunction can lead to overheating in your air conditioning unit and can even possibly cause irreversible internal compressor damage. If you notice your fan is not working correctly, get it repaired before running your air conditioner again. Frozen coil - If the coil is frozen it could indicate a few potential issues: compromised air flow, dirty air filter, obstructed ductwork, or low refrigerant. Not turning on - If your entire unit will simply not turn on, don't jump to replacing it just yet. It may be due to an easy-to-fix problem such as wiring. It could even represent a problem not with the air conditioner itself, but with the thermostat. Because we know how important it is for you and your family to be comfortable and safe, we are dedicated to repairing your air conditioner in a prompt, professional and affordable manner. Global Heating & Cooling. Call us today at (773) 801-3734! If your air conditioner repair costs more than $150 we will automatically wave the trip charge!